From safety tips and pumpkin carving kits for kids to reflective stickers and fun snack recipes, there are several different types of safety kits available to make Halloween a safe and happy time for everyone. Information on accessing the McGruff online Halloween information section for kids and their parents. 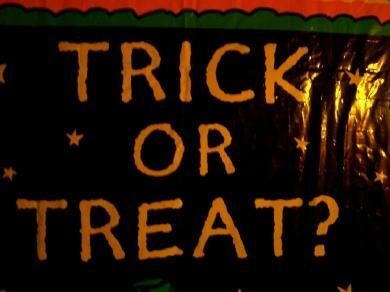 The online section has more great Halloween advice, information and tips. The McGruff website also offers reflective plastic Halloween trick or treat bags which make children more visible at night. Available in nine styles, these Halloween bags can be ordered in quantities of 150-1,000. McGruff the Crime Dog has been helping to keep children safe since 1982. Easily recognized by most children throughout the country, McGruff visits schools teaching children about safety issues. One of the most popular safety kits offered is the McGruff Safe Kids ID Kit. Teaching kids how to stay safe on the streets and the Internet, the ID kit includes a child-safe fingerprint ink and personal identity profile. The ID kit is available in English and Spanish. If children are going to be out trick or treating at night on Halloween, adding reflective tape to their costumes and trick or treat bags helps to make them more visible. You can purchase reflective tape for clothing online at websites such as Identi-Tape and Bike Somewhere. Whether you decide to use one type of Halloween safety kit or all of them, following Halloween safety tips helps make Halloween a safe and happy holiday.